The ViewSonic CDE7051-TL is the ideal 69.5’’ interactive display solution for in-classroom teaching, online training sessions, video conferencing and more. The 6-point touch-enabled display allows up to six users to simultaneously write or draw on the display’s surface using their fingers or styluses. A Full HD LED screen guarantees crisp and vivid image quality, while 350-nit brightness provides better visual performance in well-lit rooms. Equipped with a tempered glass overlay, anti-glare treatment, rounded corners, and an ergonomic design, the CDE7051-TL is designed for heavy usage in classrooms and meeting rooms. 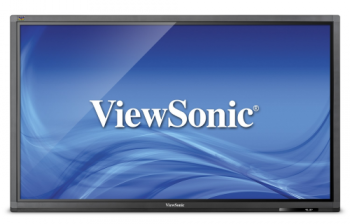 The ViewSonic CDE7051-TL is the perfect display solution for interactive learning and collaborative meetings. The CDE7051-TL features Full HD 1920x1080 resolution to deliver superior pixel-by-pixel performance for a more realistic viewing experience. At this resolution you’ll experience greater image clarity and detail—qualities that will bring high-definition multimedia content to life. 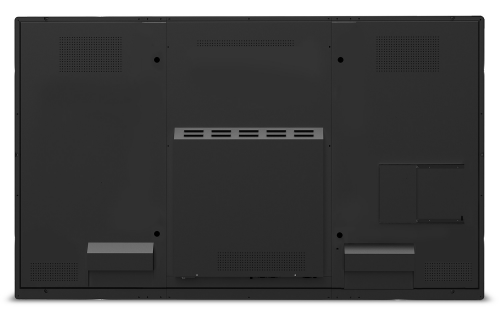 With an optional slot-in PC, the CDE7051-TL can be quickly transformed into an interactive large format display. The optional slot-in PC (NMP-707)** utilizes the Intel Core i5 processor, as well as the Windows 8 operating system, to provide additional computing power and touch functionality for fast moving educational, corporate, or scientific environments. With 6-point simultaneous touch technology, the CDE7051-TL encourages group interaction. Up to six users can simultaneously write or draw on the display's surface using styluses or their fingers – or both at the same time! And its superior touch report rate provides a smoother user touch experience for both educational and corporate applications. ViewSonic’s easy-to-use ViewBoard software is pre-installed on all CDE7051-TL displays. This software lets you write, highlight, edit, and transform documents and images on-screen in real-time. It also features screen recording, magnifier, and spotlight features that make office presentations, classroom learning, and distance education more productive, interactive, and efficient. With a versatile selection of inputs, the CDE7051-TL enables you to easily connect and use a variety of digital equipment. An HDMI input connects to high-definition content sources, while USB, VGA, YPbPr and CVBS ports deliver additional connectivity options. The ViewSonic CDE7051-TL features 7H scratch-resistant surface hardness that ensures durability, as well as a consistent, high-quality touch experience. In addition, an anti-glare film improves screen visibility in bright environments. A rounded-corner design provides a safer learning environment for active students by helping to prevent injuries in the classroom. The ViewSonic CDE7051-TL features an energy-saving LED backlight with a lifespan of over 30,000* hours, and more than a decade of durability. This lowers power consumption and the cost of ownership, while producing a high ROI, making our products a great long-term investment. RS232 connectivity enables computers and laptops to be connected to the CDE7051-TL. RS232 connectivity also allows IT personnel to conveniently manage multiple displays, configure devices, and upgrade firmware from a centralized location. 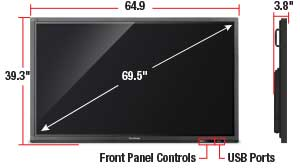 This provides organizations the ability to better maintain and control large numbers of displays from a single location. A unique edge border design redefines the relationship between the bezel and panel, eliminating any dead angles in a Windows 8 touch environment. This design provides an improved user touch experience. In addition, a pull-out charm bar is easily accessed from the screen’s edge, providing simple navigation and access to a variety of applications. With Windows 8 Pro and MS Office software, the CDE7051-TL is ideal for both office and school use. A built-in browser provides users instant access to the internet, while Windows 8 compatibility creates an interactive and collaborative experience. Users now have more options to choose from with access to a growing list of free and customized Windows 8 apps. The CDE7051-TL has two integrated 15-watt stereo speakers that enhance on-screen multimedia performance with crystal-clear stereo sound. Users can also add an additional speaker via the SPDIF audio-out port. This allows users to conveniently expand their sound systems to different locations in the room or venue, via cable. The CDE7051-TL includes 3 styluses that can be used to write on the display. Although the CDE7051-TL can be wall mounted for a solid and safe user touch experience, we also offer a trolley mount (LB-STND-003)** that provides the flexibility of a mobile display. *Actual savings may vary based on usage and other factors. **Optional accessories i5 PC (NMP-707) and Trolley (LB-STND-003) sold separately. Specifications and availability are subject to change without notice. Selection, offers and programs may vary by country; see your ViewSonic representative for complete details. Corporate names, trademarks stated herein are the property of their respective companies. The ViewSonic® NMP-707 network media player delivers smart whiteboard functionality for ViewSonic interactive models CDE7051-TL and CDE8451-TL. This slot-in PC module easily plugs into compatible displays and supports high-definition audio and video. With a powerful Intel® i5 processor, the NMP-707 provides the computing power needed for educational, corporate, or scientific environments. In addition, an integrated Windows® 8 Pro operating system delivers Windowscompatible touch functionality such as a pull-out charm bar and simple navigation to a variety of applications. The NMP-707 is capable of storing and playing hours and hours of high-definition multimedia content thanks to its 4GB of built-in memory and 500GB HDD storage. Connectivity options include RJ45, VGA out, and four high-speed USB 2.0 ports. Utilizing an Intel Core i5 processor, the NMP-707 provides additional computing power needed for fastmoving educational, corporate, or scientific environments. Pre-installed with Microsoft® Windows® 8, the NMP-707 provides access to MS Office Suite applications ideal for both corporate and educational use. A built-in browser provides users instant access to the internet, while Windows 8 compatibility creates an interactive and collaborative experience. The NMP-707 is capable of storing and playing hours and hours of high- definition multimedia content thanks to its 4GB of built-in memory and 500GB of HDD storage. This reliable media player will display dynamic content with no crashes, freezes, or lost content. The NMP-707 is specifically designed for use with the ViewSonic CDE7051-TL and the ViewSonic CDE8451-TL. When plugged into these compatible large format displays, the NMP-707 provides additional computing power and smart whiteboard functionality. 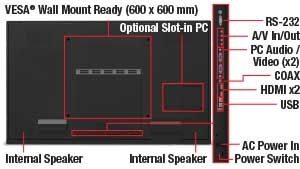 The NMP-707 can be easily plugged into compatible displays and provides simple configuration and maintenance of custom multimedia settings. The ViewSonic® NMP-708 network media player delivers integrated interactive functionality for ViewSonic large format displays CDE7051-TL and CDE8451-TL. This slot-in PC module easily plugs into compatible digital signage displays and supports true 4Kx2K Ultra HD audio and video. With a powerful Intel® i5 processor and NVIDIA® GeForce® GT GPU, the NMP-708 provides the computing power needed for educational, corporate, or scientific environments. In addition, an integrated Windows® 8 Pro operating system delivers Windows-compatible touch functionality such as a pull-out charm bar and simple navigation to a variety of applications. The NMP-708 is capable of storing and playing hours and hours of high-definition multimedia content thanks to its 4GB of built-in memory and 500GB HDD storage. Connectivity options include RJ45, HDMI out, Mini DisplayPort, and six high-speed USB 2.0 ports. Utilizing an Intel® Core™ i5 processor and NVIDIA GeForce GT GPU, the NMP-708 provides additional computing power needed for fast-moving educational, corporate, or scientific environments. Pre-installed with Microsoft® Windows® 8, the NMP-708 provides access to MS Office Suite applications ideal for both corporate and educational use. A built-in browser provides users instant access to the internet, while Windows 8 compatibility creates an interactive and collaborative experience. The NMP-708 is capable of storing and playing hours and hours of high- definition multimedia content thanks to its 4GB of built-in memory and 500GB of HDD storage. This reliable media player will display dynamic content with no crashes, freezes, or lost content. The NMP-708 can be easily plugged into compatible digital signage displays and provides simple configuration and maintenance of custom multimedia settings. The NMP-708 is specifically designed for use with the ViewSonic CDE7051-TL and the ViewSonic CDE8451-TL. When plugged into these compatible large format displays, the NMP-708 provides additional computing power and interactive functionality. N ote: Special Order - Contact us to talk to our product specialitst before you order. This item is not refundable, non-cancelable once ordered.